Now while you may be online looking for The Range discount codes, before we get to that we want to tell you a little bit of information about what makes The Range such an awesome retailer. Now while they do have a dedicated garden section that features sheds, gazebos, playhouses and other garden structures and accessories, The Range is the kind of retailer who sell a little bit of everything. You can get a bed, kitchen sink, Frozen toys, electronics, tools and pretty much everything else under the sun. The Range is the kind of store that would be perfect to go to if you have a doomsday bunker and want to fill it up with a bit of everything! We are not looking to give you a million The Range voucher codes today. We are simply aiming to save you guys some money in legit ways. Ways that actually exist, ways that do not see you have to click about five links to then just end up on The Range homepage where you will not save any extra money. We are not promising you lots of magic codes that will somehow save you over 50 percent off the price of your order, but what we can show you is ways that people have actually saved money when shopping at The Range. The best tips that 90% of people who SAVE money at The Range use! It would be fantastic if we lived in a world where there was multiple sites that offered The Range voucher codes and other kinds of special deals, but the fact is even dedicated garden building retailers do not make a huge amount of profit on a shed. So there is no way a general little bit of everything kind of retailer, like The Range is going to offer huge discounts on shed and cut their profit even further. That though does not mean there is not special offers, sales and a few other ways to ensure your money goes as far as possible. That is what we are looking at right here. Ways that you can ensure you are getting a great The Range deal and also a few ways to help you keep informed about special offers and promotions that The Range might have. Look at their garden sale section: A sale section at a retailer like The Range as the potential to be an absolute nightmare. We know that when you are looking for a shed the last thing you want to do is have to sort through a bunch of SpongeBob and Transformers toys to find it. Well The Range know this and they have made sure that once you click their sale tab, you are not just thrown in at the deep end. 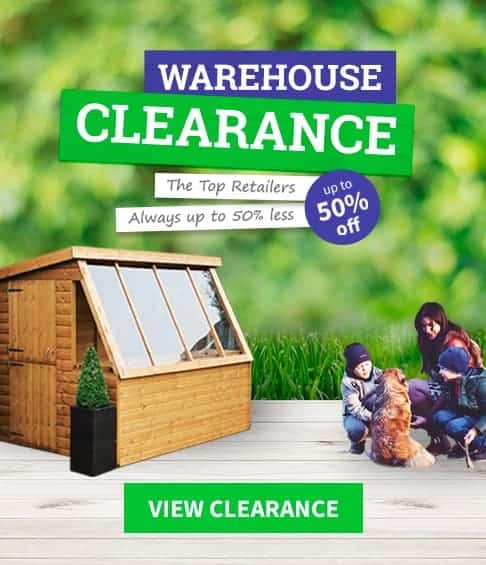 They have multiple different sale sections so you can just click, garden sale and then look at any sheds, gazebos or garden accessories that they currently have on sale. This section is great and each time we have looked at it there has been multiple pages of items and always at least one or two garden buildings on sale. TIP TWO: Take Advantage Of Their Free Delivery! Free delivery on items that cost over £50: Now this The Range deal we are talking about here is not actually a special deal for just their garden buildings or even garden accessories, but it is still something we feel you should know about. The Range offer free delivery on items priced over £50. Now this is great and we do not see you having any problems with it, but they do say if an item is on the fragile or super large side then you may have to still pay for delivery even if your item is priced at over £50. So while some sheds and other garden buildings may very well come with free delivery there is the chance certain ones will not so be sure to check if you have to pay postage before you hit buy it now. Keep up to date on The Range special offers with their newsletter: Look we know that the last thing you want is 20 emails a day about how you can save £3.50 on a toaster, but we do feel that signing up for The Range’s newsletter is worth your time. It is not like you are going to get multiple emails a week, but you will get an email from them when they have a The Range voucher code, special sale, flash sale or just some kind of crazy offer. This is very minimal effort on your part and it is something we feel is worth your time doing. The Range Facebook and Twitter pages will have special offers: Some of you may find the idea of going on Facebook and Twitter just absolutely horrible. But we are not suggesting you look at pictures of your neighbours pets or a Slimming World meal that your cousin just made. The Range have both a Facebook and a Twitter page and on here they always post their latest deals, special offers, sales and even competitions. Now of course much of this is nothing to do with garden buildings. But following them on Facebook and Twitter is a great and hassle free way to keep an eye on when sales are starting. TIP FIVE: Look At Their Mega Drop Deals Section! The Range also have a second sales section: Is there a more dramatic sounding sale than the Mega Drop Deals sale? You are not going to find a load of The Range voucher codes or discount codes here, but what you will find is items that are part of a flash sale or even better, clearance. Clearance items are always available at a heavily reduced rate as they want rid of them! You can get some great bargains in here, but you will have to do a bit of digging as they do kind of just lump everything together in here. They do have some filters on the side of the screen so you can select certain things which can make looking for what you want a heck of a lot easier. While there is not always sheds and other garden buildings in here. Their Mega Drop Deals is still worth you having a good look at. A round-up of all the current The Range voucher codes we found online. As you can see from our guide up above, you can get some great The Range deals without the need of a The Range discount code that you got from some kind of magic man at the end of a magical quest. It would make writing this guide a lot easier if there was a ton of The Range voucher codes floating around online, but the sad and actually pretty frustrating truth is that there is not this never ending supply of The Range promo codes like money saving sites would like you to believe. Most of the time these sites do not care about you getting the best shed your budget can afford and just care about you clicking their links so they make a couple of pounds from your time! The amount of money saving sites that claim to offer amazing The Range deals is pretty crazy. We have the most popular ones down below. These are sites that come up when you search on Google so these are the most common sites you are likely to see when searching for: The Range Voucher Codes, The Range Coupon Code, The Range Current Discounts, The Range Discount Codes and The Range Sale. These are the most common Google search terms when searching for The Range vouchers and other deals and these are the terms we used to make this list. Most of The Range deals you see online will not be for garden buildings! Even though The Range is a retailer who sell a bit of everything, we were still impressed with their garden section. They do have a decent amount of sheds, playhouses and other garden structures. But the fact is, garden buildings are just a small part of what The Range are all about. This means that most money saving sites will not have deals that are specifically for garden products so that is something to keep in mind when you find a money saving site that has five pages of The Range deals on it! What they claim? Voucher Cloud may waste your time, but at least they do not waffle on and on about how they have the latest and best The Range voucher codes. They actually get straight to the point and will just list all The Range deals they have right at the top of the page. This is something that we do actually like to see a money saving site do. What We Found? They do give you a little bit of information about the kind of retailer The Range is, but this is off over to the side so you can ignore it if you want. Now when it comes to their The Range deals they just have the current sales. So if you click their deal for 50% off garden items, you just get taken to the garden page of their sales section. So while they are linking you to the various sales pages of The Range. They are not actually saving you any money or giving you any special offers. What they claim? The Range Discount Codes 2016 is the first thing you will see here. My Voucher Codes claim that the different The Range deals they have are all current. Just before you get to their list of so called deals, you will notice that they claim the deals they have are all current up to whatever month it is. What We Found? We found the same links here that we are sure we are going to see on most of the sites that have made this list. Ok so on one hand things here are kind of legit. You see the links they have are for things like The Range garden sale, The Range bathroom sale and so on. These are actual valid sales that are on The Range site right now, but the problem is by coming to My Voucher Codes before you go to The Range, you are not actually saving yourself any more money. You are just wasting about ten minutes of your time! What they claim? One of the things that Re Vouchers do which is quite interesting is that instead of having a big banner claiming they have the most current The Range voucher codes, they give each deal that they have its own, for lack of a better term, expirations date. Each deal has the date it was added and when it is valid until. What We Found? We found the same kind of links here as we have at the other sites on this list. When you click them they are actually for sales and deals that are valid, but there are no actual special savings by doing so. Also they have expired The Range discount codes listed here as well as links to other random brands and retailers to try and tempt you with. This is something we do not like as it is comes across as a way to just try and get you to click more of their links. What they claim? Voucher Codes are quite a straightforward money saving site. They get straight to the point and make it clear right away that The Range voucher codes they have are all current and still valid. We are looking at their site in June 2016 and that is when they say their deals and codes are valid for. What We Found? To be honest and fair with you, Voucher Codes is one of the less offensive sites on this list. We clicked all the links they had and they all take you to the right place. So if you do click the gardens sale section you are taken to that part of The Range site. But the problem we have is that while these links may work, you are still not going to be saving a penny more than if you were to have just gone to The Range website directly. Voucher Codes kind of work as a middleman, but a middle man who is not actually going to save you any money so we would suggest you just go straight to The Range’s website yourself. What they claim? One of the things that certainly caught our eye about 360 Voucher Codes was how they did not just claim that The Range discount codes they have were valid for the current month. But that they were also valid for the next one as well! What We Found? Out of all the sites on this list, 360 Voucher Codes is one of the most stacked when it comes to The Range voucher codes. They have a huge selection that is going to waste a good chunk of your time to check them all out. Now they do have links to actual sale sections on The Range site like the other money saving sites do, but they fill out their page with links to all kinds of random products. Now some of these products are actually on sale, but others are not for example one of their deals is for a high quality garden dining set, but when you click the link, you do not get money off it. You just get taken to its sales page! VoucherSlug – List same deal over and over again! What they claim? Here at WhatShed we have done a few different voucher code guides and Voucher Slug feature on most of them. The thing that always catches our eye about Voucher Slug is the way that they claim their The Range voucher codes are updated daily. What We Found? They do have links to the current sales going on at The Range, but as we made our way down the list of deals that Voucher Slug had we noticed something odd. This is that they list the deal for free delivery multiple times! They just word it in a different way so it seems a little different. This is done just to make it seem like they have more The Range deals than they really do which is pretty sneaky if you as us. What they claim? Coupon Rando is not actually a site we have had a lot or experience with and when we first looked at their The Range discount codes page, we did not really notice a whole lot of bragging or much of anything really. What We Found? There is only a handful of The Range voucher codes listed here so we had a good look at all of them. Most of them are the current deals that are running right now on The Range’s website, but there are some that are old and expired which have not being running in weeks! Now the problem we have is that while they tell you when they verified the code they do not tell you that they are no longer valid! What they claim? Promo Vouchers are not actually making any wild and over the top claims on their The Range deals page. They do have a fairly decent number of so called deals, but at least they are not bragging about them and trying to make them sound better than they really are which is nice to see. What We Found? We had a really good look down their list of The Range discount codes and we noticed that many of the deals they had listed were ones that we had actually seen on The Range’s website. So they do at least have current information on here. The problem is that all of the links we clicked took us to the exact same page! So even if you did go crazy and decide to use this site as a middle man, once you click their link and get taken to The Range, you are going to still have to look around the site to find what it is you clicked for in the first place. VoucherBox.co.uk – No up to date deals! What they claim? The first thing that will catch your eye about Voucher Box is how right at the top they say that this page is for The Range voucher and discount codes for whatever the month is. What We Found? We found that not to be true at all as not one of The Range deals they have listed here is actually valid! Every single one is expired. Now to be fair they do state this at the start, but their claim that there are no current The Range offers happening is something we know for a fact is simply not true. This site would just waste your time in so many ways. Please just go to The Range’s website directly and save yourself the headache of coming here. UKPromoPro.com – They list expired deals, codes and offers. What they claim? On UK Promo Pro they claim that The Range voucher codes they have are actually good to go not just for the current month, but also the next one. This is quite a bold claim as many, many retailers can have a sale then take it away just a couple of days later. What We Found? The first thing we found was what at a glance looks like an incredible amount of The Range discount codes and offers. They have all the current offers which are running right now. So the current garden deals are represented here, but they are the exact same deals you get directly from The Range. So you will not even save an extra penny by coming to this site first. Also they have a whole section that is dedicated to old The Range voucher codes and what we do not like about this is that they try to tempt potential customers to use them by claiming they might still work. Support WhatShed: by making a purchase after clicking a link above, a portion of the sale supports this site. The definitive guide to deals, voucher codes, discount codes and other money saving tips. Get deals & tips now!